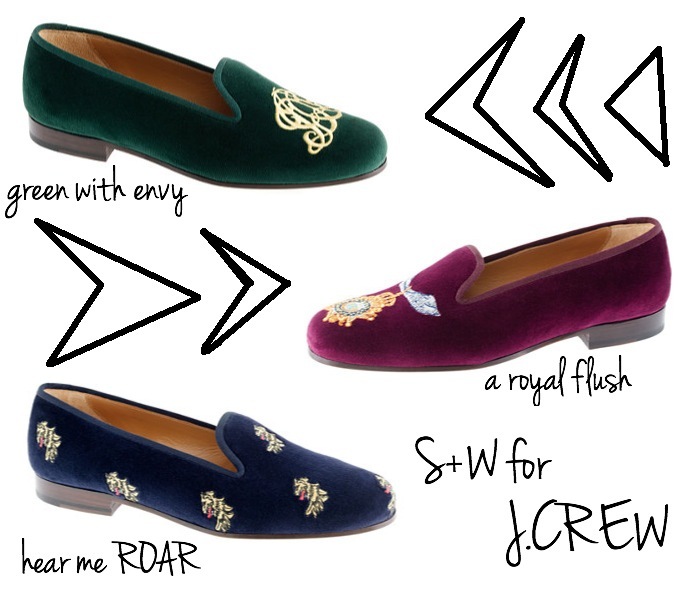 some of you may know stubbs & wootton, a shoe brand recognized for its velvet slippers with unique embroidery. j.crew is known for forming partnerships with brands and developing gorgeous projects ( a la fenton fallon, lulu frost, altuzarra, etc.). i have yet to partake in the slipper trend, and the price of these shoes will be holding me off from participation, but there is nothing like wishful thinking or serious longing. my favorites happen to be the navy slippers with lion embroidery, which may have something to do with my serious affinity for anything lions: i’m a leo, my hair is a bonafide mane at times, lions are my favorite animal, and lion king is my favorite movie! i’ll either save my money up (which i doubt i’ll be able to do) or i’ll hope and pray that these go on sale. which pair do you guys like?